The 16th issue of Pokemon Fan, which went on sale on February 18th, 2011, featured its entire coverage of the TV series to the (then) upcoming two-parter. Below are scans of all six pages. These first two pages don't really tell us anything new. 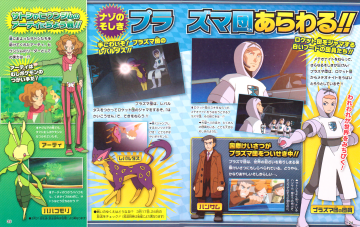 Though I guess the full-body shot of Flint in his Rocket-Dan uniform is worth noting? These next two pages recap what's been happening with the Rocket-Dan so far. 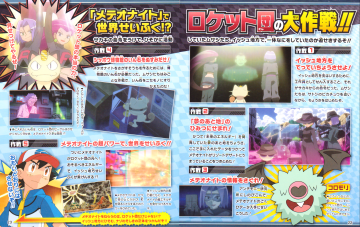 At the end of page 23, we see two shots from the two-parter that weren't shown in any of the previews that aired on TV. 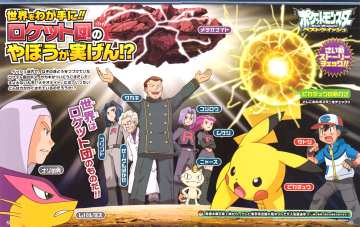 Oh look, it's the Plasma-Dan! And Handsome's there!